I have an interest in historic things and taking people on walks around Australia. Located close to the water in a small village called Davistown you will find The Little Teapot Cafe. 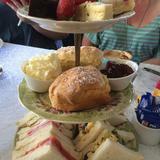 This is a well known haunt for the locals who love "High Tea" or enjoy meeting up with friends. I recently took a group of ladies for High Tea and our table was located at the back of the shop inside with a beautiful chandelier above us. There were local artist's paintings and gifts in the bookcase. The High Tea had delicious scones with jam/cream (this was most talked about), little petite cakes and selected sandwiches. There are twelve different varieties of tea or you can order a coffee. There is a lovely selection of sweets on display in their front counter from cakes, slices, banana bread and pancakes. Little Teapot Cafe has a lovely courtyard where you can sit outside under cover and why not bring a book to relax or enjoy sitting under the umbrella's with a group of friends. I would thoroughly recommend this cafe and being a foodie lover this is located in an ideal spot within walking distance to the water where you can go for a lovely walk after your meal. Next time you are visiting the Central Coast pop into The Little Teapot Cafe. This is a very popular cafe so if you have a large group it's advisable that you book a table in advance.